In NCAA gymnastics, execution is important to an athlete’s success. Gymnasts strive for perfection and look to minimize form deductions as much as possible, and difficulty often takes a back seat as a result. At the same time, the NCAA’s top athletes will also aim to include high difficulty in their routines without sacrificing on execution. In fact, routines on bars, beam, and floor all start from a 9.5. Gymnasts are required to achieve bonus points to get to the 10.0 start value, and they do this by adding in difficult skills and connections. “D” level skills get an extra 0.10 in bonus, and “E” level skills get an extra 0.20. In addition, connection bonus is determined differently on each event. Gymnasts can only receive a maximum of +0.40 in bonus from connections and +0.40 from D/E skills. Have you ever wondered which NCAA teams have the most difficulty in their line ups? The Super Six lineups were looked at and ranked by difficulty. For the observation, any falls that took place in the competition were ignored. The Florida Gators have the most difficulty distribution of D and E skills within the Super Six teams. Next, Oklahoma gained their bonus from mostly E level skills. They had seven different “E” level skills, which were competed by various gymnasts in their lineup. Next for UCLA, they had four of their “E” level skills competed by Peng-Peng Lee, which is a lot. LSU was fourth when it came to difficulty in their bar routines, they had one “E” level skill and the rest of the routines included “D” level skills. As for Utah, they also tied for fourth place with LSU when it came to bar difficulty. They had one routine with an “E” level skill, and the other routines included “D” level skills. Finally, Nebraska came in sixth. Overall, their line up only had “D” level skills. Overall, there were a wide range of “D” and “E” level skills that were exciting to see in the team’s routines. What team bar line up was your favorite? My personal favorite was UCLA’s bar lineup. 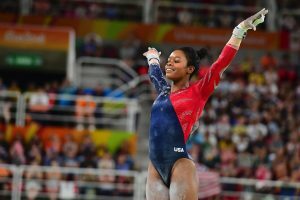 Is Gabby Douglas going to the 2020 Olympics? U.S. gymnast Gabby Douglas was the star of the 2012 London games, becoming the first African American gymnast to ever win gold in both the team and individual all-around at the same Olympics. But, in 2016, Douglas’ Olympic experience didn’t go as smoothly in Rio De Janeiro. Unfortunately, she failed to qualify for the individual all-around competition and then finished seventh overall in the uneven bars final. To add to this, she was also criticized on social media for not placing her hand over her heart during the playing of the U.S. national anthem and later for not appearing to support her teammates Simon Biles and Aly Raisman during their all-around final events. Douglas walked away from Rio with a gold for the team all-around event for the second time in a row. Since gymnasts typically retire young, Douglas is not expected to return to the Tokyo games in 2020. Unfortunately, I also believe it is true the Douglas will not return to the 2020 Olympics. Sometimes gymnasts that train at the Olympic level get burnt out, resulting in them only being able to compete in one or two Olympic games. I do believe Douglas was burnt out in the 2016 games, so its highly unlikely she will be returning to the 2020 games in Tokyo. What do you guys believe? Do you agree that Douglas is officially retired and not returning to try and make the 2020 Olympics? Is Aly Raisman heading to the 2020 Olympics? Aly Raisman has a good shot at making it onto the 2020 U.S. Olympic Gymnastics team. At 23, she’s still in top shape: she has competed in two previous Olympic games and shows the leadership to be the captain once again. However, lately, Raisman has gotten attention for the statement she delivered during Larry Nassars sexual abuse hearing. Over a period of four days, more than 150 young women and their parents addressed the former doctor, confronting him about his abusive behaviors towards them. Judge Rosmarie Aquilina sentenced Nassar to 175 years in prison. Additionally, Nassar was sentanced to an additional 25 to 40 years in a separate case in Michigan’s Eaton County. Raisman has now become a voice for change in the sport. She has stated she won’t rest until there is an independent investigation of both USA Gymnastics and the U.S. Olympic Committee, as well as Michigan State University, where Nassar worked as a sports physician from 1997 to 2016. Both the USOC and USA Gymnastics have said that they support investigations into their organizations. For now, Raisman says she would like to focus on bringing justice to this case. She believes that doing that is way more important than earning another gold medal. Personally, I believe that if Raisman didn’t have this case to worry about, she would be fully capable of going back to the 2020 Olympics due to her drive and love for the sport. What do you guys think? Do you believe she’d be able to make a comeback and make it to the 2020 Olympics? Is Laurie Hernandez going to make a comeback? Olympic gymnastics champion Laurie Hernandez plans on competing in 2019, according to her agent. 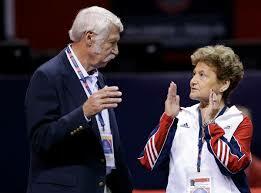 Hernandez has not competed since taking team gold and balance beam silver at the Rio Olympics. Hernandez stated that she hoped to compete in 2018 but would not rush a comeback. Hernandez since decided not to compete at the U.S. Championships this August. I personally have not heard of Hernandez training or practicing anytime soon. I think it will be harder for her to come back because she has taken a long break from gymnastics and its hard to get back in shape and be on the same level that she once was after such a long break. I believe that she should start her come back soon. The more she puts it off, the more she’s not going to want to come back. Hopefully she starts to get back into her normal training again soon. What do you guys think? Do you think she will have a tough time coming back since she took a long break? Are you rooting for her to come back? Five months into her return to full-time training and 19 months since her last competition at the 2016 Rio de Janeiro Olympics, Simone Biles is amazed at what she can accomplish. Biles, is working every day but Sunday at the family-owned World Champions Centre in suburban Montgomery County alongside new coaches Laurent Landi and Cecile Canqueteau-Landi and her new training partner, 2016 Olympic team alternate Ashton Lockler. She won’t compete again until late July, but as her time in the gym increases while red-carpet walks, award shows and promotional appearances decrease, Biles and Landi agree that things are going remarkably well. Landi, said Biles has shown she can perform her Rio routines at a top level while also working in new elements. Detailing event by event progress, Biles has added an extra half-twist into the foam practice pits on each of the two vaults she performed in Rio and on floor has added a forward tumbling salto skill to fulfill a new requirement in the International Gymnastics Federation’s scoring system. Her floor music is a Middle Eastern motif — “different than anything I have done but still fast and upbeat” — and her balance beam is about the same as the one she performed in Rio, with the addition of a half-turn on one of her opening moves. Landi said Biles’ Rio routine on bars, updated to deal with changes in the code of points scoring system, is good enough to get her to finals at major events. Overall, I think Biles is doing great. Its extremely hard to come back to the gym after being in the Olympics. 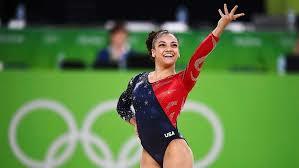 I knew that she would do great because she is an extremely talented gymnast. I hope she continues to work hard and master her new skills even more. The Karolyis, whom are being time coaches in the US gymnastics world, are suing USA Gymnastics and the U.S. Olympic Committee over the allegedly wrongful termination of a contract in which the organization was to purchase portions of the ranch. The couple also blames USAG for not informing them of Larry Nassar’s wrongful actions after the organization knew of his crimes. The lawsuit read…”During the negotiation of the purchase agreement, USAG never informed the Karolyis of Larry Nassar’s alleged sexual misconduct on the property although they had knowledge of the same from the reports they received in 2015”. According to court documents, the Karolyis are looking to get compensation for “breaches of contract and duties owed to plaintiffs which have resulted in severe damages to plaintiffs’ reputation, health, and real property,”. The couple has stuck to their initial statements—that they had no knowledge of Nassar’s abuses that took place on their property prior to his arrest. Do you guys believe that the Karolyis had no clue about Nassars abuses? Or do you believe that they knew and covered it up like other coaches did? Team USA nominated for USAG best of April! 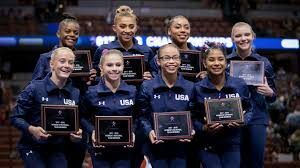 USA Gymnastics and DOW, a company aimed at sustainability through science and sport, have teamed up to present a monthly award recognizing the achievements of Team USA. The award recognizes one male athlete, one female athlete, and one team of the month. The women’s team, which dominated the 2018 Pacific Rim Championship, is among the nominees for April’s award! The U.S. women’s team from the 2018 Pacific Rim Championships has been nominated for the U.S. Olympic Committee’s Team of the Month for April. The U.S. women’s team won its 10th straight Pacific Rim Championship this past weekend in Medellin, Colombia, by a 15-point margin. Grace McCallum and 2017 World all-around champion Morgan Hurd finished first and second, respectively, in the senior all-around competition. In the junior meet, Jordan Bowers, and Kayla DiCello also earned gold and silver in the all-around standings. Rounding out the team was Jordan Chiles who was the gold medalist in the senior vault and floor exercise finals, and junior Sunisa Lee who won silver medals in the vault, balance beam and floor exercise. I think its great that the women’s team has been nominated and is being recognized for all their hard work. They deserve to be rewarded and I hope that they win. Do you think the team deserves to be rewarded? USA earns titles during event finals at Pacific Rim competition! 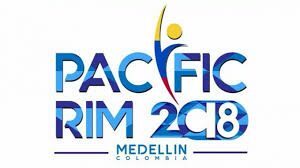 A day after taking the team title and the top two spots in the junior and senior all-arounds, the U.S. women picked up an additional 12 medals in event finals at the 2018 Pacific Rim Championships in Medellin, Colombia. Jordan Chiles advanced to the floor final, where she beat out teammate Grace McCallum to win gold with a 13.650. Chiles improved on her performance in the team competition by four-tenths after posting 13.250 on Saturday. Chiles also won gold on vault with a 14.188. She rounded out her competition with a bronze medal on balance beam where she bounced back from a fall to earn a 12.175. McCallum, picked up bronze on vault with a 13.425 average and silver on floor with a 13.600. She struggled just a bit on uneven bars and balance beam and finished seventh on both events. On the junior side, Kayla DiCello earned gold medals on vault and uneven bars. DiCello scored a 14.525 to win the vault title with a 13.625 for a solid uneven bar set. DiCello narrowly missed a third medal on balance beam when she finished fourth by less than a tenth. Sunisa Lee earned three silver medals after solid performances on vault, beam, and floor. Jordan Bowers added to her all-around title with a bronze medal on uneven bars when she earned a 12.900. Bowers also won gold on floor exercise with a 13.725. Team USA did great at the Pacific Rim Championships and it was an amazing competition to watch. What team did you guys enjoy watching the most? USA dominates the Pacific Rim Championships! In their debuts with the U.S national team, Grace McCallum and Jordan Bowers came away with the all-around titles at the Pacific Rim Championships in Medellin, Colombia. McCallum finished with a 54.850 to win the senior crown while Bowers finished with a 53.600 to win the junior crown. The U.S. women brought home the team title with a score of 218.850. Canada finished second with a 203.400 and Australia was third with a 197.550. McCallum was the only U.S. all-around competitor to hit all four routines. Her performance earned her a spot to all four event finals on Sunday afternoon. I think the gymnasts did great in their US national team debuts. I think they will continue to do great as they continue with their gymnastics careers. 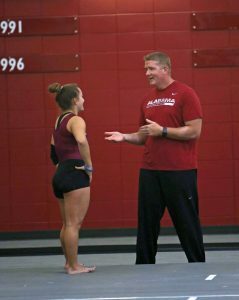 After 22 seasons with the University of Alabama gymnastics team, assistant coach Bryan Raschilla has not renewed his contract for the 2018-2019 season. The Crimson Tide finished their season ranked No. 8 in the nation after qualifying to NCAA championships but failing to make the Super Six final. Apparently, head coach Dana Duckworth told Raschilla his contract was not going to be renewed on the Monday after the championships. While Alabama gymnastics has not released an official statement, TideSports.com received multiple statements from Duckworth. “My decision was based on a continual assessment of this program and was made in the best interest of its ongoing success,” Duckworth said. She also stated…”We are thankful for all Bryan’s contributions to our program and his many years of service and wish him all the best going forward”. Raschilla hopes to continue his coaching career with a different college gymnastics team. I personally think it’s not fair that Raschilla was fired. I don’t know the details behind the firing, but it seems extremely harsh to fire a man that’s been with the program for 22 years. I hope Raschilla can find another coaching position that suits him well.